I couldn’t be more in favor of putting wine in packages that will, one, take care of it (i.e., keep the air and light out long enough for me to drink it while it’s still sound) and, two, make it easier for me to drink it in all sorts of places (the beach, the trail …). 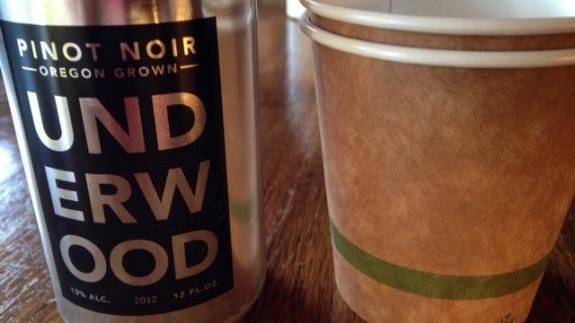 So a can of Oregon Pinot Noir—Underwood 2012—appearing on my desk was a bright spot in my otherwise murky day today. I couldn’t be more in favor of putting wine in packages that will, one, take care of it (i.e., keep the air and light out long enough for me to drink it while it’s still sound) and, two, make it easier for me to drink it in all sorts of places (the beach, the trail …). So a can of Oregon Pinot Noir—Underwood 2012 from Union Wine Co.—appearing on my desk was a bright spot in my otherwise murky day today. There was no reason to wait to pop the top, so I can give an immediate report: Sadly, I’m more a fan of the packaging than the Pinot, which was kind of murky, like my day. Maybe unforgiving Pinot Noir—notoriously hard to make good in lower price ranges—isn’t the right wine for a can. What about a great Oregon white? Pinot Gris, Riesling … I’d be excited about that, because wine in a can is pretty cool.